This story begins four years ago. Just after graduating from college I took a month-long backpacking trip around a number of European cities. 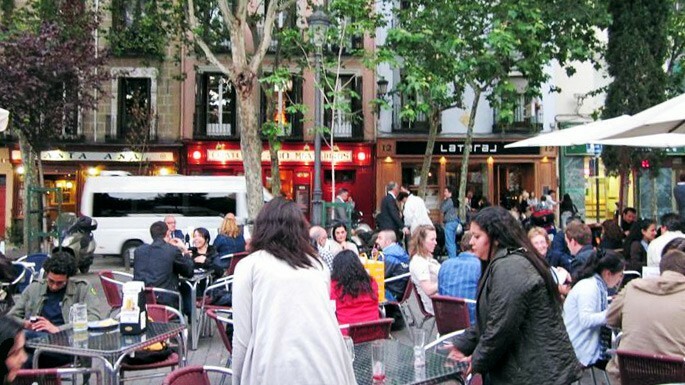 One of the many stops was in Madrid and on that leg of the trip, my buddy Evan and I stopped for a budget-friendly tapas and beer-filled lunch at the now shuttered outdoor Plaza Santa Ana location of 100 Montaditos. Seeing as we were traveling on the cheap, their dollar beers and mini sandwiches known as montaditos were a perfect fit for us. And would you look at that, I even managed to scrounge up some old photos from that first trip. But that’s not what this post is really about. Fast forward four years. 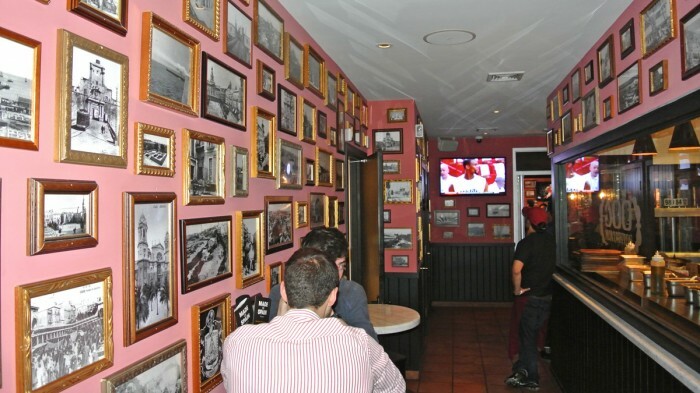 Now I’m living in Greenwich Village and I learned that this beloved Spanish mini-chain decided to expand to the US, starting with a first location right on Bleecker Street just a block from my apartment. Serendipity? Maybe. All I knew is I needed to go and see if it could live up to my memories. My first attempt at visiting occurred on a Wednesday evening soon after they opened. 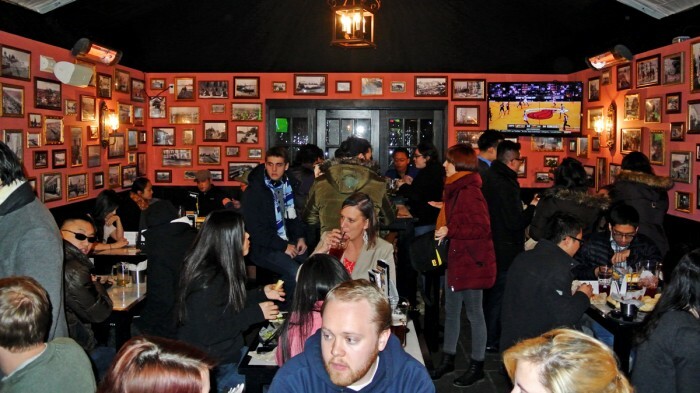 Every Wednesday, this location runs a special where nearly everything on the menu including their montadito sandwiches and beers are offered for merely a single dollar. 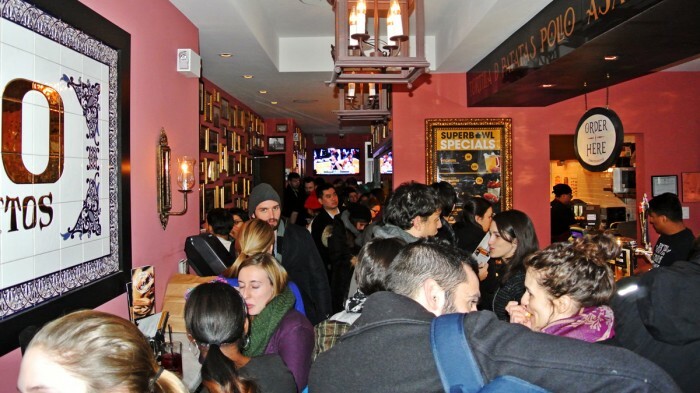 Since this place is right in the heart of NYU territory and it was a new addition to the neighborhood at the time, it was of course mobbed. I didn’t really want to deal with that kind of chaos that night so I left to revisit on another night. So, I came back a few weeks later, this time with my girlfriend along for the adventure. Ahhh, a much calmer and much better. This time I could actually walk right up to the counter, place my order, and snag a table with ease. In the mood for both food and drinks, we started with a pitcher of sangria. They offer a number of sangria varieties including a classic red, a white, a cola-based, a lemon flavored, and a “clara” which to be honest, I’m not exactly what what that is. But after consulting with the cashier, we ended up with the traditional red sangria. It came in an absolutely enormous pitcher and only ran us $10 for the gigantic thing. Yeah, it was a bit sweet for my taste, but come on — ten dollars for a gigundo pitcher of sangria is still a killer deal. You’re of course gonna want some food with that pitcher and the obvious choice would be to select a few of their namesake montadito sandwiches. The menu has 100 different sandwich varieties which in my opinion can be a little overwhelming to choose from. 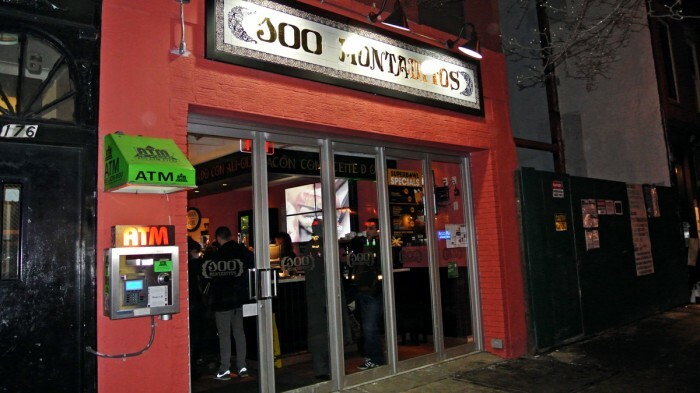 They are grouped by price point which ranges from $1.50 up to $3.00 and offer a whole variety of traditional fillings like Lomo and Chorizo along with American-fusion fillings like Philly Steak and BBQ Pulled Pork. They also come in preset combos if you’re not up for making the decisions. 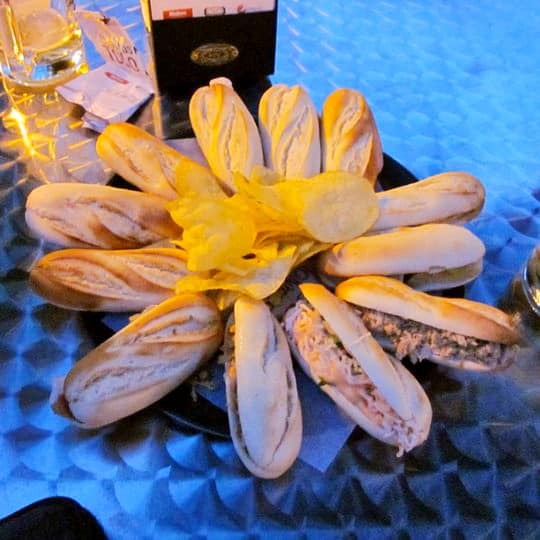 The bread, which is all baked in house, is one of the restaurant’s claims to fame, but if you go this route, I implore you to select some of the more traditional Spanish ingredient-filled ones. Those are definitely the restaurant’s strong suit. But you’re also not going to want to overlook the platters. 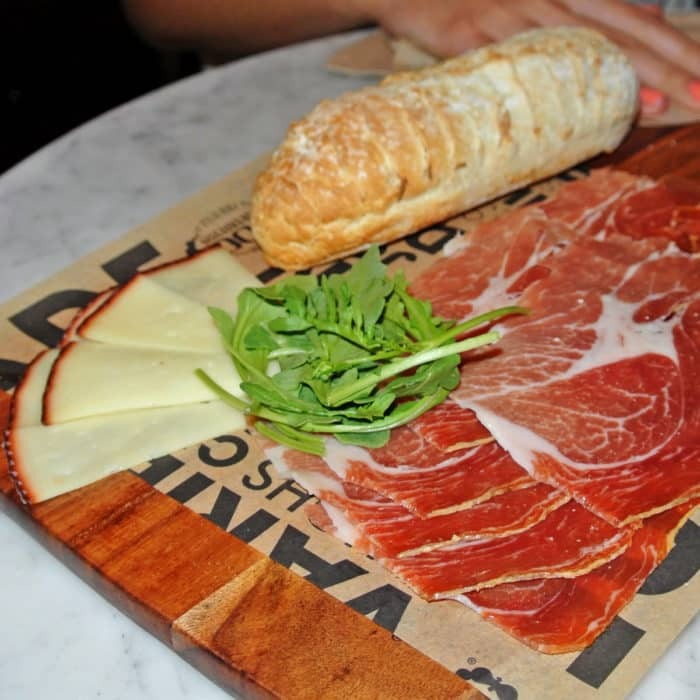 On our visit, we decided to choose a Jamón Serrano & Manchego Queso Platter instead going for the famed montaditos and we were certainly not disappointed with the choice. For $12 we were given a platter layered with a generous portion of very high-quality sliced cured meat. Jamón Serrano is like a salty, smokey, meaty cousin to everyone’s Italian favorite — prosciutto. And the platter included a whole mini-loaf of that fantastic, freshly baked bread which paired really well with the firm slices of aged sheep’s milk cheese and sliced meat. These are simply ingredients — meat, cheese, and bread, but they are executed extremely well and create a really nice platter to munch on while you drink sangria. 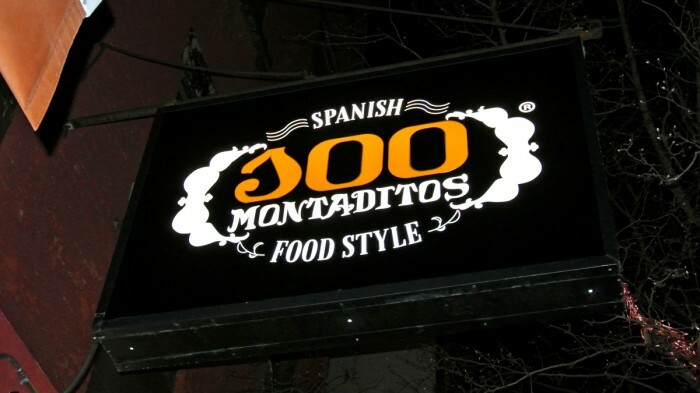 So if you’re looking for a reasonably priced but authentic and high-quality taste of Spain, head to 100 Montaditos in Greenwich Village. I’m happy to report that everything at this US location is just a good as it was when I first sampled in back in Spain. Got another international import in NYC I should check out? Let me know in the comments below.